This security poster illustrates the PSM-1 Bulgarian Anti-Personnel Mine. This anti-personnel mine is manufactured from zinc alloy and has a removable central tube with charges and booster. The triple fuze adaptor of the PSM-1 Bulgarian A/P Mine allows the mine to be initiated by trip wire, pressure, or electrically. This security poster features the technical specifications of the PSM-1 Bulgarian Anti-Personnel Mine, a top view without fuze to show the priming compound, a PSM-1 with a single fuze, the cast zinc alloy adaptor, a sectioned PSM-1 with triple fuze adaptor and shipping plug, and a deployed PSM-1 with the triple adaptor and the MUV-2 Fuze, the MNV-2M Fuze, and the EVU command fuze. A deployed PSM-1 with the triple adaptor and the MUV-2 Fuze, the MNV-2M Fuze, and the EVU command fuze. The top view without fuze to show the priming compound. A sectioned PSM-1 with triple fuze adaptor and shipping plug. A PSM-1 with a single fuze. The cast zinc alloy adaptor. The technical specifications of the PSM-1 Bulgarian Anti-Personnel Mine. 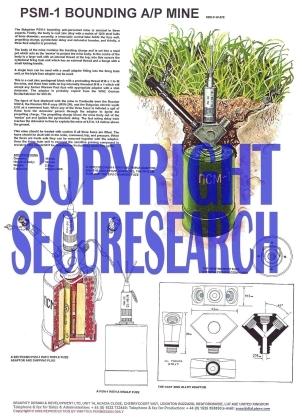 This security poster features the technical specifications of the PSM-1 Bulgarian Anti-Personnel Mine, a top view, a PSM-1 with a single fuze, the cast zinc alloy adaptor, a sectioned PSM-1 with triple fuze adaptor and shipping plug, and a deployed PSM-1.